By now the California “generator parties” of the 80’s that spawned bands like Kyuss, Fu Manchu and Queens of the Stone Age and arguably the entire stoner rock genre, have become legendary. If you haven’t heard about them, they were essentially free shows played in the desert using gasoline powered generators to power the equipment. With no club scene within 100 miles of the place, local bands would throw these parties as an excuse to drink some beer and showcase their music in front of their buddies. 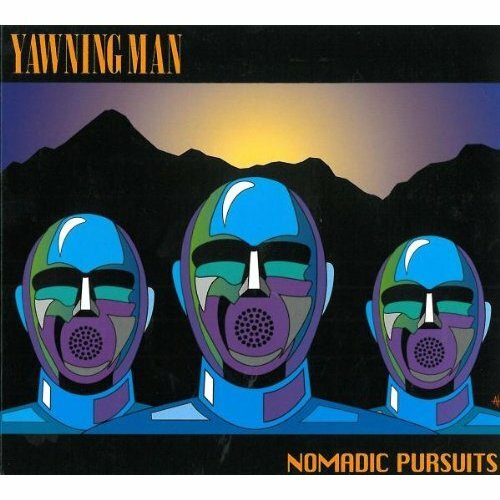 Yawning Man were one of those bands. The current lineup features Gary Arce on guitar, Mario Lalli on bass and Alfredo Hernandez on drums. You may recognize Hernandez as he was Brant Bjork’s replacement in Kyuss and played drums on that band’s final album “…And the Circus Leaves Town”. With that kind of pedigree, Yawning Man had a lot to live up to when I hit play on their latest release Nomadic Pursuits and let me just say…I was not disappointed. The band plays an atmospheric blend of jazzy, post rock with flourishes of guitar wizardry and drum acrobatics that are subtly breathe taking. This is music that you can play loudly while driving at breakneck speeds or put on in the background while you close your eyes and meditate. The free-form nature of the songs flow from one right into another and they’re best experienced when taken together as an overall piece of work. I’d say it’s psychedelic, but that word doesn’t seem to do this justice. Given that there are no vocals, the listener is left to explore the instrumentation to its fullest, which is lush and filled with layers and textures. Just follow a guitar part or a bass line throughout a song and then hit repeat and see what you hear the next time through it. There is so much going on here that your mind will make up the lyrics if you find them necessary. I mean just take a listen to Hernandez’s drums on “Ground Swell” or the beauty of the guitar in “Camel Tow Too”. Go ahead…hit play…close your eyes…lose consciousness.